SFIG Vegas, hosted by the Structured Finance Industry Group and the Information Management Network, is billed as the world’s largest capital markets conference. For three and a half days in February, the full spectrum of structured finance industry professionals gather to discuss everything from leveraged loans to solar ABS. Capital One uses this annual gathering to quiz participants about the state of credit, underwriting and financial technologies and asset-based securities. 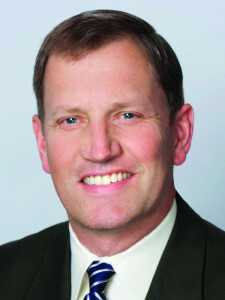 Dave Kucera, Capital One’s senior managing director and head of Financial Institutions, spoke with ABF Journal after the conference to interpret the survey results. Respondents included professionals from across the asset-based securities industry. Percentages reflected in the charts used in this article are based on 151 responses. 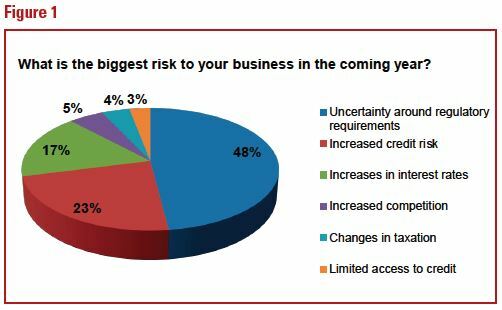 As Figure 1 clearly demonstrates, almost half the respondents (48%) believe uncertainty surrounding regulatory requirements poses a risk to their businesses. But Kucera does not believe conference participants are shying away from developing their businesses because of that risk. “Regulation continues to be one of those things that is hard to navigate just as change occurs whether it’s at the federal level or at the state level,” Kucera says. “But, more broadly, in some of the themes we’re hearing from the conference, there continues to be pretty strong bullishness, probably on the margin, and more willingness to invest in growth and invest in their companies. And I think that’s helping equipment finance platforms, and we’re seeing some evidence that it may help ABL platforms. “If you look at how interest is deductible, or not going to be deductible in the future, arguably there’s a deleveraging aspect to it that’s going to make cash flow financing a little harder and a little less attractive. And it’s possible that working capital ABL and factoring could, on the margin, be a little bit of a winner,” he adds. 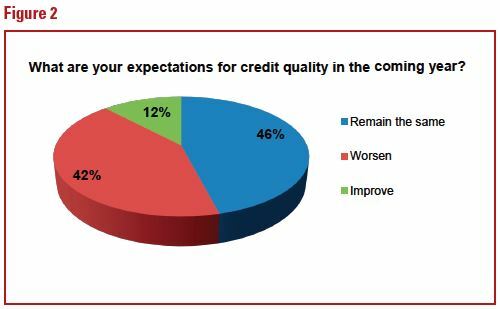 When it comes to credit quality (see Figure 2), almost 42% of respondents expect the situation to worsen while 46% expect it to remain the same. Kucera acknowledges the stock market has been performing well so far, but says, “As rates rise, that can create some challenges, especially for more levered companies or companies that are used to a low interest rate environment and haven’t been in a low interest rate environment for a long time or for a newer company that maybe never experienced it. 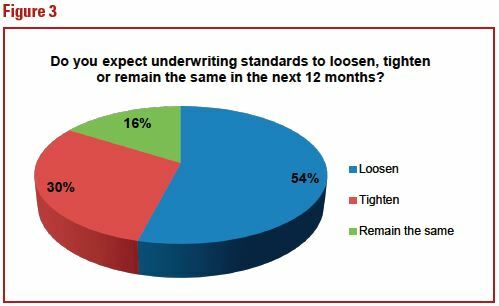 A question about underwriting (see Figure 3) demonstrates a large discrepancy, with 54% believing standards would loosen and 30% predicting they would tighten. “We’re still in an environment where there is lots of capital available to invest in the sector,” Kucera says, explaining that more capital has been raised than what is needed by borrowers, so the supply/demand imbalance favors borrowers. “That favoring is shown in two ways. One is potentially better funding prices. Secondly, it’s possible that terms get loosened.” In this environment, Kucera says the forecasts about the direction of terms are not surprising since, on the margin, borrowers may get better terms, which translates to worse terms for lenders. On the cash flow side, covenants have been getting looser over the last couple of years, but cash is tighter despite this trend. 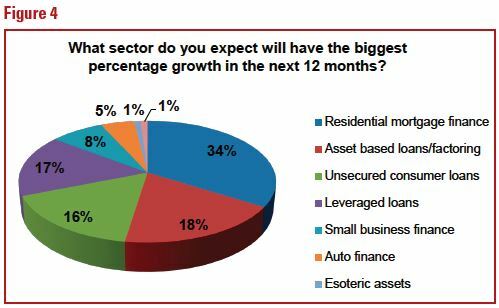 This leads to growth in the ABL sector, which 18% of respondents predicted would grow by the biggest percentage in 2018 (see Figure 4). 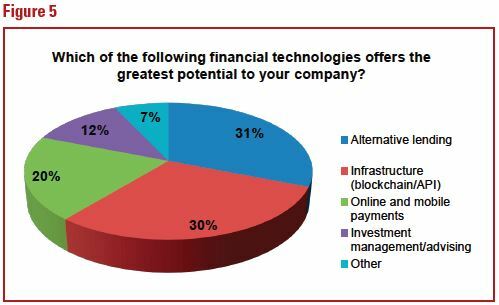 When it comes to technology (see Figure 5), respondents are gearing up to invest in blockchain (30%), online and mobile payments (20%) and alternative lending (30%). Kucera says technology affects every industry. “It’s becoming a need to have rather than a nice to have,” he says. Although ABL and factors have traditionally been very paper-intensive industries, they are looking for ways to automate. “Whether it’s automating the information against the assets or just getting rid of major steps to impact risk, we’re seeing that technology is evolving in all aspects of specialty finance origination, financing, underwriting and serving. We expect that trend to continue if not actually accelerate,” he says. 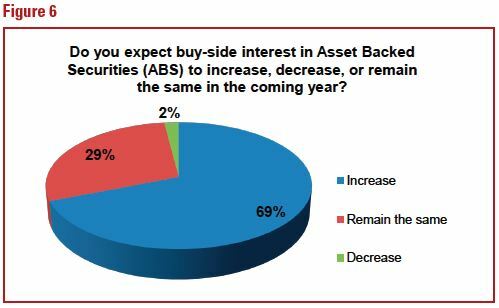 Finally, an overwhelming 69% of respondents expect interest in ABS to increase in the coming year (see Figure 6). He predicts the U.S. securitization market will expand and be used by more companies in a bigger way over time. Next year in Las Vegas, we will learn how closely these predictions came to hitting their targets.